지석묘는 청동기시대 사람들이 만든 무덤으로 고인돌이라고도 하는데, 지상에 책상처럼 세운 탁자식(북방식)과 큰 돌을 조그만 받침돌로 고이거나 판석만을 놓은 바둑판식(남방식)이 있다. 경기도 파주 덕은리에서는 20여 기의 탁자식 고인돌과 선사시대 사람들이 살았던 터가 함께 발견되었다. 가장 큰 고인돌의 덮개돌 길이는 3.3ｍ, 너비 1.9ｍ로 조개날돌도끼(양인석부)와 숫돌 등이 나왔다. 그 아래에서는 선사시대 긴 네모꼴의 움집터가 나왔는데 깊이 40∼90㎝, 길이 157㎝, 너비 370㎝에 이른다. 벽을 따라 작은 기둥 구멍이 있고, 화덕자리가 2개가 있다. 벽이 불에 탄 자국과 바닥의 재로 보아 집이 불에 타 무너진 것으로 보인다. 집안에서는 구멍무늬토기(공열토기), 간돌칼(마제석검), 돌도끼(석부), 가락바퀴를 비롯한 여러 유물들이 출토되었다. 긴 네모꼴 집터는 서울 역삼동, 파주 교하리 유적에서도 보이는 형태이다. 집터의 연대는 B·C 7세기경으로 보고 있는데, 이는 고인돌이 B·C 7세기 이후에 만들어 졌다는 것을 알려준다. 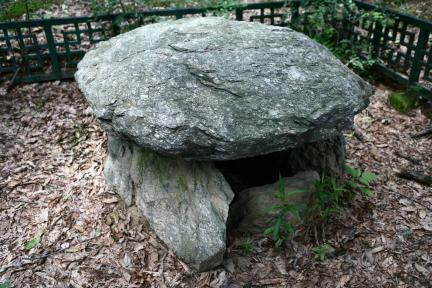 Jiseongmyo or Goindol is a kind of dolmen that was the predominant form of burial during the Korean Bronze Age. 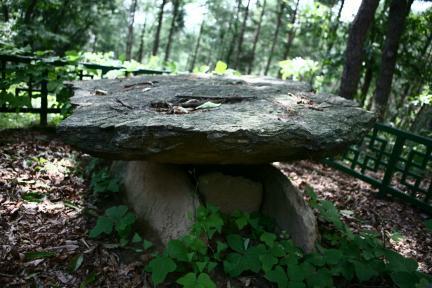 In Korea, there are two types: the so-called bukbangsik (northern style) looks like a table, whereas nambangsik (southern style) consists of only a boulder or one placed atop smaller rocks. 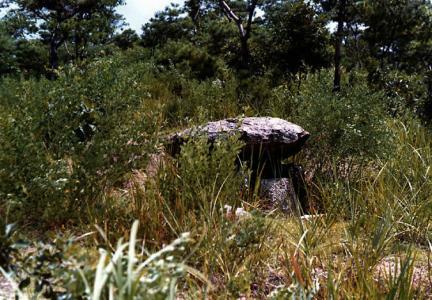 Relics such as stone axe and grindstone were found in the dolmen, with the biggest boulder measuring 3.3m long and 1.9m wide. 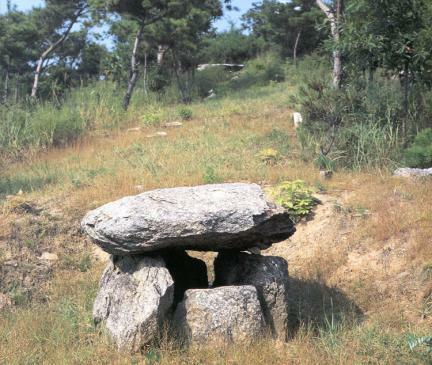 Under the dolmen, the dugout site of the prehistoric age, which has depth of 40-90 cm, length of 157 cm, and width of 370 cm, was unearthed. There are small holes for pillars along the wall and sites of 2 stoves. The traces of burning on the wall and the ashes on the floor suggest that the dugout has been burnt down. 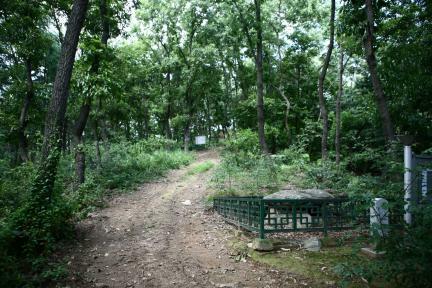 The dugout site, shaped like a long square, has also been found in the relics of Yeoksam-dong in Seoul, Gyoha-ri in Paju. Lots of relics were unearthed such as earthenware carved with pattern of holes, polished stone daggers, stone axes, and spinning wheels. 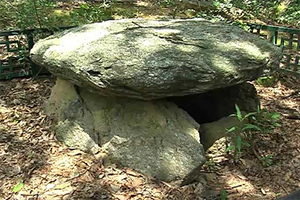 Assuming that the dugout was built around 7th Century BC, the dolmen is believed to have been made after the 7th century. This relic is important evidence that polished stone daggers started to be made earlier than the Korean-style slender bronze dagger, which began to be made around the 4th century. It also shows the culture of using vessels carved with the pattern of holes around the 7th century.